Lewis Carroll’s ‘Through the Looking Glass’ is a charming novel which is the lesser known sequel to ‘Alice’s Adventures in Wonderland’. If you find yourself looking for a book that is not only captivating, but relatively easy to read, ‘Through the Looking Glass’ is for you. Though the novel has not received the same level of acclaim as its predecessor, it is very much its equal: just as bizarre and lovable, it, too, captures the innocence of childhood in a way that is both magical and captivating. This can be seen not only through the book itself, but through John Tenniel’s illustrations which bring the story to life in a way that has captured the imaginations of readers since its publication in 1871. It is in many ways, as indicated in its title, a mirror to its predecessor ‘Alice’s Adventures in Wonderland’, and in this instance, Alice’s curiosity takes her on another brilliant adventure. This novel, however, is not set in Wonderland, but in a parallel universe which Alice enters through the looking glass after she contemplates what the world is like on the other side of a mirror. Shortly after entering, Alice finds herself in a parallel world that is laid out exactly like a chessboard. 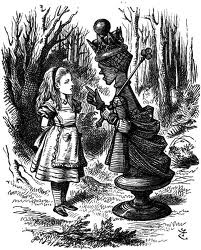 Alice, a pawn, then meets the Red Queen who informs her that if she can move to the eighth rank, she will make her a queen too. Here, following on from the novel’s mirror theme, Alice soon discovers that on the chessboard, many things are the exact opposite of what exists in the real world – time, for example, runs backwards instead of forwards, outcomes precede events, and she must walk in the opposite direction in order to reach any of her destinations. Though a children’s book, the complexity of this novel cannot be underestimated, and this is what makes it an ‘essential read’. Alice’s quest to change rank from a pawn to a queen could, for example, be said to represent the inevitable journey which she must make from childhood to womanhood. In order for her to become a queen, she must follow a set of predetermined rules on the chessboard – controlled largely by outside influences – as is the case in any individual’s journey to maturity. The text’s complexity – and more importantly charm – is also complimented by the numerous poems contained within, my personal favourite being ‘The Walrus and the Carpenter’: the tale of young oysters who are tricked out of their shells into following the walrus and the carpenter to ‘To talk of many things: Of shoes – and ships – and sealing-wax – Of cabbages – and kings,’ only to be eaten – a fable that could be said to warn of the dangers which face children in the adult world.